Unions and members of the Government’s Pension Engagement Committee are set to return to the negotiating table on Friday, 14 December 2018 to continue negotiations after government’s new proposal at the 7 December meeting was rejected. At the conclusion of the meeting last week Friday, the unions were requested to submit a counterproposal so that Cabinet members can discuss it at their weekly Monday meeting on 10 December. 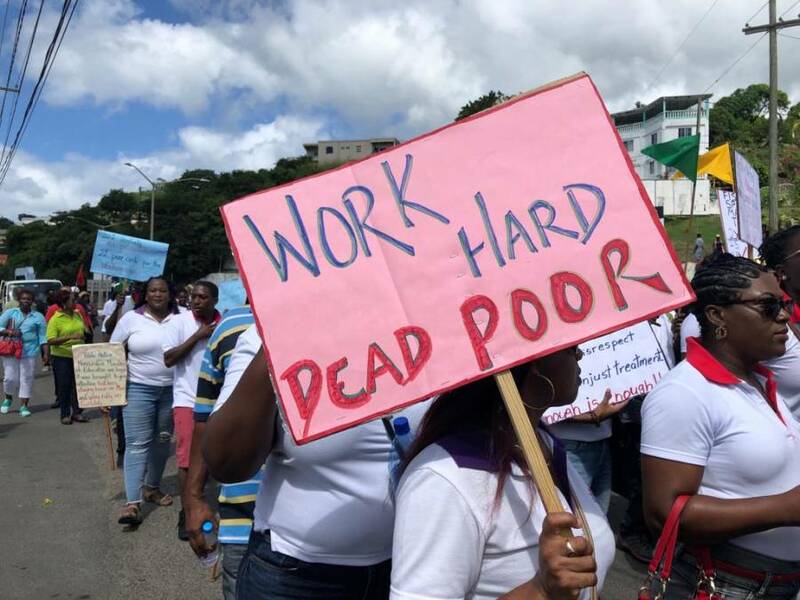 In an update to members, dated 7 December, the Grenada Union of Teachers (GUT) provided an update to its members explaining that government had provided a new proposal, but it was rejected by the unions and staff associations. Explaining to members that the substantive points put forward at the meeting was that pension will be paid at 60 years and that the new proposed advance payment formula for government’s component of pension is 8% x 8 years. “After much discussion, the unions and associations reject this proposal. The Pension Engagement Committee then asked us to submit a counterproposal soonest which we are now in the process of preparing,” GUT President Lydon Lewis told members in the memo. Before the 7 December negotiations, Andre Lewis, the Labour Movement Representative in the Senate told the House that the new offer from government on the gratuity package for retiring public officers was worse than what was previously offered to bargaining bodies for workers. Government is offering 2% x 12.5 years. “Government’s offer is worse than what was offered before,” Andre Lewis told members of the Senate while making his contribution to the 2019 budget debate. Lewis, who is President General of the Grenada Technical and Allied Workers Union (GTAWU) and current president of the Grenada Trades Union Council (GTUC) said that he was unable to share more details about the new offer, but assured they are looking forward to resolving this matter. The Pension Engagement Committee of the Government of Grenada and the labour unions along with staff associations representing public officers are at a stalemate over gratuity and pension packages. Government is offering a 2% gratuity offer while the bargaining agents are demanding 25%. Since 5 November public officers have engaged in sporadic industrial protest that has seen workers staying off the job. At the end of November through discussion with the various religious groups and the private sector, a commitment was given that unions will return to the bargaining table. The unions’ counterproposal was submitted in time for Cabinet’s consideration on Monday while the negotiations will continue on 14 December. Neither the government nor the unions have disclosed details of the counter-proposal from bargaining agents. Prime Minister Dr Keith Mitchell and other government ministers have continuously claimed that accepting the 25% gratuity will cripple the country financially and this will cause the country to lose millions in grant funding.